Buy 1 - 3 for $51.99 ea. Buy 4+ for $43.99 ea. The Trane Perfect Fit BAYFTAH23M2 23.5x21x5 Air Filter is a replacement air filter for the Trane model BAYFRAME215A and TFM215A0AH1 air cleaners. The Trane Perfect Fit filter measures approximately 23.5" x 21" x 5" and features a MERV 8 rating for the reduction of airborne contaminants. 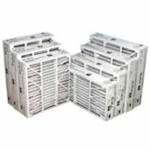 Trane air filter are durably built and are highly efficient at improving indoor air quality. 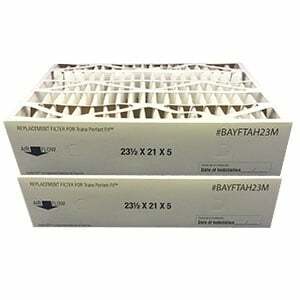 Dimensions: 20.1" x 23.2" x 5"
FiltersFast Brand 21x23x5 Perfect Fit BAYFTAH23M 2pk. For odor reduction, this filter is made with fine carbon powder bonded to lofted polyester media. The frame is constructed with moisture resistant 28 point beverage board and the media pack is totally bonded to the frame. 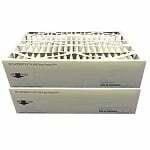 This furnace replacement filter reduces airborne pollutants like dust, mold spores, pollen, dust mites and pet dander. 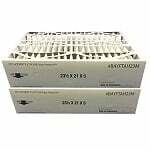 This money-saving value pack contains 2 Trane 21x23x5 Perfect Fit Filters. The filter support is constructed with a 30 gauge galvanized expanded metal grid. This residential air cleaner filter replacement is made with 5" deep pleated Quality Pleats designed to replace comparably sized air duct products and outperforms panel fiberglass filters. Nominal dimensions: 21" x 23" x 5"
Actual dimensions: 20.1" x 23.2" x 5"
Upgrade your MERV 8 Trane 21x23x5 Perfect Fit BAYFTAH23M Filter to the MERV 11 Trane Perfect Fit BAYFTAH23M Compatible 21x23.5x5 Filter. Pre-assembly of this filter replacement makes installation quick and easy. For maximum performance of your air cleaner system, replace your Trane BAYFTAH23M Air Filter every 6 months depending on air quality and usage. 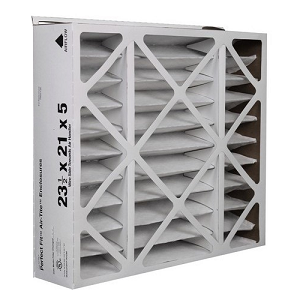 The maximum temperature capacity of this Perfect Fit furnace filter is 180 degrees Fahrenheit (82 degrees Celsius), based on continuous service.